I know dear readers that I am a day late and a bit narcissistic, but it’s never too late to thank everyone for this blessing and Jakarta Globe for the opportunity. After a quite thorough interview with Ms. Lydia Tomkiw, it’s settled that I will be on air on August 18, 2011. On this occasion I’d like to copy paste my engagements and everything I talked about my passion for food back then in case the link someday vanished into thin air. Rian Farisa comes from a family that loves food. He moved to Jakarta four years ago to work a nine-to-five job in the banking sector. The daily grind started to get to him, so he decided to do something new after work. 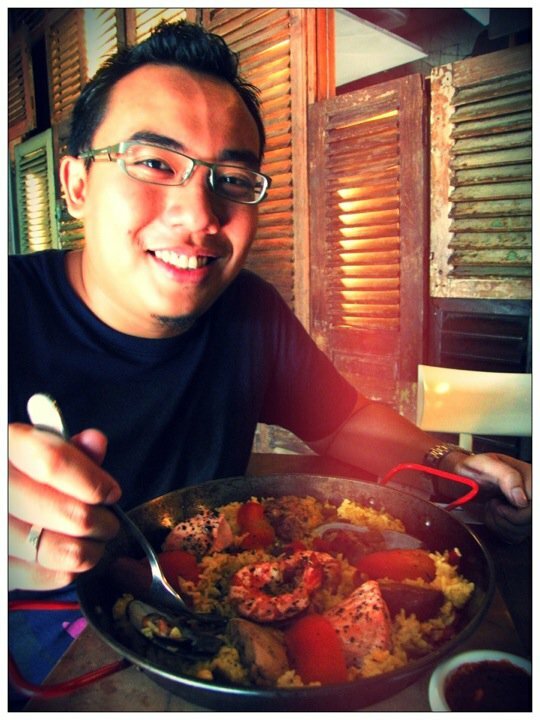 In 2009 he started writing a food review blog, The Gastronomy Aficionado, covering Jakarta’s dining scene. The tagline of Rian’s blog reads, ‘The more I eat, the more I criticize. Just let me be severe about it, so they will reflect upon it.’ And Rian isn’t afraid of giving his opinion. He wants to take food reviews ‘to the next level’ and give his readers fearlessly honest assessments. Rian, how would you describe the dining scene in Jakarta right now? Jakarta has really improved a lot. Every day, new restaurants with different themes and genres open. Even things you find more in Singapore and Malaysia, like Indian, are getting to Jakarta. The dining scene is very modern and very pricey as well. There are many varieties now. Two years ago you wouldn’t see coffee shops like Anomali so much in Jakarta. Now I see people who studied abroad and then came here and brought back the concept they found, like Sour Sally’s. Jakarta really is the melting pot of everything. How did you come up with the name for your food blog, The Gastronomy Aficionado? Most people like to write their names. I wanted to use a sophisticated name. I wanted something rare, something people don’t use a lot. It took me two days to think of the name of the blog. The word gastronomy because I want to discuss all aspects of food, not just whether it is yummy or not yummy, but also the things that surround the food — the service, the interior and the price. And, aficionado, because as you can see, I am a big lover of food [laughs]. What’s your favorite type of cuisine to review? I do lots of Japanese and Italian. It’s the simplest thing to find in big cities. Not to forget my roots, I also love Sundanese food. What’s your favorite Indonesian dish? I like the simple fix of fried rice, nasi goreng. You can find it anywhere. It’s probably not something you’d expect from someone who calls himself ‘Gastronomy Aficionado,’ but a simple fix of fried rice will do me good any time of the day. Do you get any advantages or perks from writing your blog? My face is not that familiar. People know me from my writing. Sometimes people ask me to review and sometimes there are food blogger gatherings for restaurant openings. It’s not like I go to a restaurant and say, ‘Hi, my name is Rian. I am a food blogger. I want to eat in this restaurant for free.’ It’s not like that. Do you think food bloggers have a lot of power now? They really possess power. Especially if one or two Web sites talk about something. I got an invitation one time to an opening and the restaurant wasn’t organized. One blogger was kept waiting over an hour for food. I don’t know what she wrote, but it can’t be good. People tend to be more expressive these days. Indonesians usually tend to be quite shy about expressing their thoughts, but I guess it’s changing these days. You’re definitely not shy on your blog. Yeah. That’s the real purpose. When I made the blog I knew I wanted to be a bit harsh and a bit vocal in expressing my thoughts. I’ll be the judge. Bloggers now are getting powerful and now there are plenty of them. But the majority of them are still a bit kind. How do you choose the restaurants you are going to review? Randomly, actually. But I tend to review new restaurants because with new restaurants people usually Google them right away and want to know all about them. That’s the thing about blogging, you have to keep it up to date. How do I do it? Well, I bring my notebook and camera. I don’t have to tell them I am a food blogger. I do it anonymously. I don’t have to be sneaky. Sometimes you write in Bahasa Indonesia sometimes you write in English. Tell me about making that choice. Mainly I write in English. But a few magazines have asked me to write in bahasa so that’s why I’m doing it. I need to expand myself as well. I need to expand in different languages and expand my knowledge. How much money do you spend a month on eating out? Well, sometimes if I’m reviewing for a magazine, I get reimbursed. I’d say up to Rp 1 million ($120). A few hundred thousand rupiah will usually do. Most of the time I am going with my wife. She likes that I have a food blog. It’s a blessing in disguise. She can come whenever I want to try something new. What’s the best thing you’ve eaten recently in Jakarta? About a month ago I was invited to the Mandarin Oriental Hotel and Michelin star Chef Fabien Lefebvre was there. We got a chance to test his food and publish something about it in the media. That was probably the first time I had eaten a Michelin star chef’s food in Indonesia and it was really good. Rian Farisa was talking to Lydia Tomkiw.